Keeping mission-critical systems such as the Dell PowerEdge VRTX up and running at peak performance is essential to business continuity and organizational success. 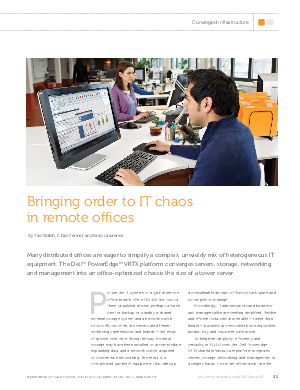 To minimize disruptions and maximize productivity, the Dell ProSupport Plus plan is both proactive and personalized to specific organizational needs. So whether mission-critical workloads are running in a data center or in ROBO environments where the PowerEdge VRTX acts as a data center, organizations can take advantage of top experts armed with intelligence gathered from across the Dell support base.